How did trade develop in ancient times? In early societies, people did not need money. Before 10,000 sc, most people provided food for their families by hunting , fishing, and gathering nuts and berries. They made clothing from animal skins. These ancient people lived in caves or built homes from mud, grasses , and branches. They worked together in family groups to meet their needs. As the human population grew larger, more food was needed. Family groups moved from place to place to follow herds of animals or find new places to Fish. During their travels, they met unfamiliar groups of people. In time, these groups began to trade with one another. Each group could get the items they needed or wanted by giving away some of their extra supplies. One group might offer deer meat in exchange for fish. Animal skins might be traded for fruit. Any object could be traded as long as the two people agreed that it was a fair exchange . For example, one animal skin might be traded for ten fish. Twenty pretty shells might be exchanged for five colourful feathers. The exchange of goods without using money is called barter. Over many years , people's way of life began to change. Family groups started to settle and develop new ways of getting food. Around 8000 BC, people learned how to grow crops and raise animals on farms. Families produced enough food for themselves with a little left over for trade. 6000 BC, potters made clay jars for storing and cooking food. Other people became skilled at making farm tools, building boats, or grinding grain into flour. By specializing in one skill, people made or grew more goods than they could use. They also began to live closer together in towns and villages. People started using objects as money when bartering became too complicated. What if the carpenter did not need the two rugs being offered for his table? Who would decide how much wheat is equal in value to a boat? To make trading easier, people in different parts of the world began to use objects as currency , or money. Around 6000 bc, animals and food became the first objects used as money. People in a particular area decided the worth of an animal such as a cow or goat. The animal could then be used to buy goods. Other types of early money included barley (ancient Sumer, now the Middle East), almonds (India), and salt (China and the Mediterranean region). The first objects used as money did not always last well over time. Salt could be ruined in the rain. Grains like barley or wheat often rotted and lost their value. Cows lasted well but could not be divided to make small purchases. As time passed, traders started using money that could survive bad weather. They also looked for objects that could be carried easily during long journeys. Historians believe that cows were the first form of money. Cows started being used as money between 8000-6000 bc. They were valuable because they provided food and clothing. In parts of Africa, cows were used as money until the mid-1900s! Ancient people realized metal could be a long-lasting form of money. By 1850 BC, people used lumps of gold, silver, and bronze to buy goods. These lumps of metal were called ingots. The Sumerians in ancient Mesopotamia (modern Iraq) were the first people to use ingots. As they travelled , they spread the idea of using metal as money. Ingots were shaped as bars, rings, rods, and loops. What is an ingot worth? Since ingots varied in size and shape, their value depended on their weight. The heavier the ingot , the more it was worth . Merchants receiving ingots weighed them carefully before accepting them as payment. Ingots were the first form of metal money. Have you ever collected sea shells near the ocean? By around 1400 bc, sea shells called cowries were used as money in the Shang Dynasty of Ancient China. Later, people in India and Africa also used cowrie shells as money. Other long- lasting forms of ancient money included beads, stones, tools, and even animal teeth! Around 640 BC, the government of Lydia (modern Turkey) began to make coins to use as money. Each coin was stamped with a seal that stated its weight and the purity of the metal. The coins were also stamped with the heads of a lion and a bull facing each other. The lion's head was the mark of the king of Lydia. The seal guaranteed that the coin was worth the amount stamped on it. Coins were easy to use as money. They were light enough to carry on journeys. They did not require weighing by merchants because of their seals. During the 400s BC , stamped coins gradually replaced ingots across the Mediterranean region and the Middle East. The ancient empires of Persia, Greece, and Rome created money systems using coins. What did ancient coins look like? This ancient Lydian stater was the world's first coins. They were made from a mixture of silver and gold, called electrum. Can you imagine carrying coins shaped like knives in your pocket? The ancient Chinese made coins in the shape of tools (knives, spades , and hoes) and shells. 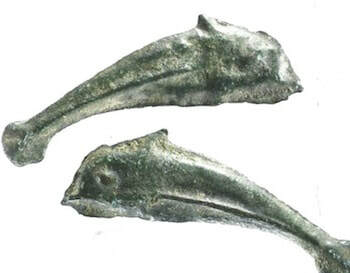 Some ancient Olbian (Russian) coins were shaped like dolphins (see photo above). The earliest Roman coins were rectangular pieces of bronze . Ancient coins were usually round . They were made from the metals found in the local area. Most were stamped with a symbol of the government leader or the place they were made . The earliest coins were minted (made from metal) individually by hand. To simplify and speed up the process , ancient minters developed moulds, or casts . With casts, many coins of the same weight could be made at once. The melted metal was poured into the casts. Once removed from the cast, the coins were hammered on each side with a metal stamp , or die, to imprint them with official government seal. Although coins in modern times are made by machine, the basic method of using casts and dies remains the same. The Romans were the first to stamp the image of a living person on a coin. After winning in war, Julius Caesar featured his portrait on a coin in 44 sc. China is credited with many early inventions, including the invention of paper money. From 200 BC onwards, the Chinese made round coins that had holes in the middle . Travelling merchants placed these coins on strings and wore them around their necks. The merchants found the strings of coins heavy and inconvenient to carry. Around AD 700, merchants started depositing their coins with bankers. The bankers would print paper note_sin return. These paper notes were equal in value to the amount of coins deposited . The merchants could take the paper notes to the bank in their home town and receive the money from the bank. In approximately AD 1020, the government of the Song Dynasty in China began printing paper money. The seal of both the emperor and the emperor's treasurer was printed on each banknote. Since the government was strong, it guaranteed the banknotes were worth the value printed on them. People grew to trust the paper money because it could be used to make purchases in the same way coins had been used. 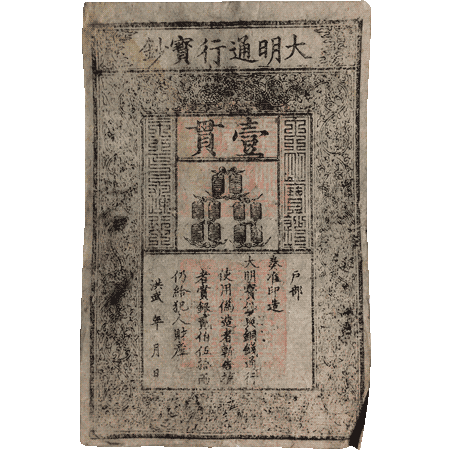 This Chinese banknote was printed by the Ming Dynasty around AD 1375. The paper was made from the bark of a mulberry tree. When did paper money appear in other countries? Europeans heard about paper money through the reports of Marco Polo in the 1200s. However, they did not use paper money until the mid-1600s . In the Middle Ages, Europe was made up of many small kingdoms that were frequently at war with one another. People did not have confidence in their governments. As a result, they would not have confidence in paper money printed by those governments. In the late 1200s, bankers and merchants in northern Italy began to use handwritten documents as money. Special signed papers, called bills of exchange, allowed merchants to travel and trade in distant countries without having to carry coins. In 1661, Sweden became the first European country to use printed money. During a shortage of coins , the Swedish Stockholm Bank began to issue banknotes. During the next 200 years, other European governments experimented with paper money. This usually occurred when supplies of metal were low, especially during wars. The Japanese began using paper money during the 1600s. At first, most Japanese banknotes were issued privately by Shinto priests. At that time, Shinto temples acted like banks. Since people trusted the priests, they also trusted the paper money to work as well as coins. Later, paper money was issued by feudal clans. A central Japanese government began printing paper money in the late 1800s. Paper money helped spark the American war of Independence. In the 1700s, many local banks printed paper money in the 13 British colonies in America. The government in Great Britain did not approve of these banknotes. The government punished colonial businesses for using them. Many colonists grew angry at this decision and supported independence from Great Britain.